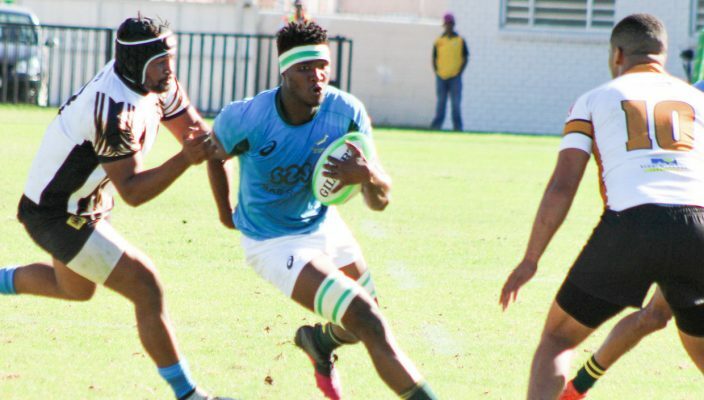 Any rugby player nicknamed “The Brick” must have something special in his arsenal, and that is indeed the case for SA Rugby Academy player and former SA Schools star, Celimpilo Gumede. The 19-year-old Gumede has big dreams for his future – both on the field and off it – after he was included in the squad of 44 players selected to participate in the Academy programme this year. The SA Rugby Academy, which was launched in 2015, aims to balance formal education with high performance training and player welfare. Thanks to the vital support from various corporate donors through the Rugby Education Foundation (REF) and sponsors such as Remgro (through the Stellenbosch Academy of Sport) and SuperSport, more than 120 players have received education bursaries to date. But where does his nickname, “The Brick”, come from? Gumede earned this moniker when he was still at school, at Durban High School, because of his tough defence and direct approach on attack. He has been part of SA Rugby’s Elite Player Development (EPD) structures since 2015, and has come through the SA Rugby Youth Week and SA Schools structures. Gumede is relishing the experience of being in a professional rugby set-up, where he and his team-mates have been working hands-on with Junior Springbok coach Chean Roux and his assistant coaches on a daily basis over the past two months. “It is an amazing experience to be part of the SA Rugby Academy – apart from working with some of the best coaches in the country, we also get the opportunity as players to learn from one another,” said the talented loose forward. “One of the biggest lessons I have learned since the programme started is that one has to be prepared mentally to get out of your comfort zone and to switch into professional mode at every training session. Through the SA Rugby Academy, Gumede has also received the opportunity to study for a B Com degree in Marketing, and he was pleasantly surprised at the fine balance struck between rugby and studies in the programme. “At first I thought it would be tough to play rugby and study at the same time, but we have been fortunate to have tutors and study sessions worked into our daily programme, which allows us to get the balance right,” he said. For Gumede, simply being part of the programme has been the biggest highlight as they approach the end of their second training camp at the Stellenbosch Academy of Sport. “Almost everything about the SA Rugby Academy has been a highlight for me, from the way we are treated by the coaches and management to the opportunity to study and the mentorship and nutrition sessions. It is a great environment to be in,” he said. Gumede has a clear picture of what he would like to achieve in future and said: “My short-term goal is to work my way into contention to be selected for the Junior Springbok squad and Cell C Sharks’ SuperSport Rugby Challenge team, and my long-term goals are to hopefully play Vodacom Super Rugby and for the Springboks one day.